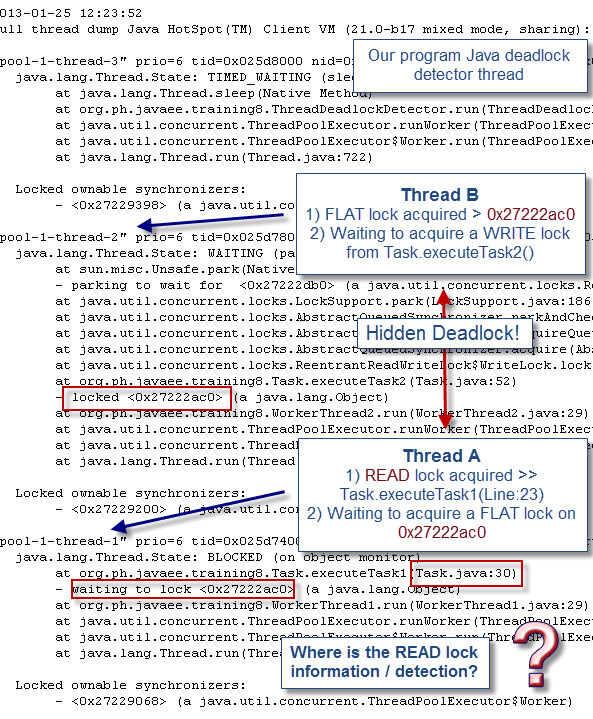 Most Java programmers are familiar with the Java thread deadlock concept. It essentially involves 2 threads waiting forever for each other. This condition is often the result of flat (synchronized) or ReentrantLock (read or write) lock-ordering problems. which is held by "pool-1-thread-1"
The good news is that the HotSpot JVM is always able to detect this condition for you…or is it? A recent thread deadlock problem affecting an Oracle Service Bus production environment has forced us to revisit this classic problem and identify the existence of “hidden” deadlock situations. This article will demonstrate and replicate via a simple Java program a very special lock-ordering deadlock condition which is not detected by the latest HotSpot JVM 1.7. You will also find a video at the end of the article explaining you the Java sample program and the troubleshooting approach used. The next step of your investigation is to analyze the collected information and establish a potential list of one or many “suspects” along with clear proofs. Eventually, you want to narrow it down to a primary suspect or root cause. Obviously the law “innocent until proven guilty” does not apply here, exactly the opposite. Lack of evidence can prevent you to achieve the above goal. What you will see next is that the lack of deadlock detection by the Hotspot JVM does not necessary prove that you are not dealing with this problem. In this troubleshooting context, the “suspect” is defined as the application or middleware code with the following problematic execution pattern. Now let’s replicate this problem via our sample Java program and look at the JVM thread dump output. This above deadlock conditions was first identified from our Oracle OSB problem case. We then re-created it via a simple Java program. You can download the entire source code of our program here. The program is simply creating and firing 2 worker threads. Each of them execute a different execution path and attempt to acquire locks on shared objects but in different orders. We also created a deadlock detector thread for monitoring and logging purposes. For now, find below the Java class implementing the 2 different execution paths. As soon ad the deadlock situation was triggered, a JVM thread dump was generated using JVisualVM. As you can see from the Java thread dump sample. The JVM did not detect this deadlock condition (e.g. no presence of Found one Java-level deadlock) but it is clear these 2 threads are in deadlock state. The main explanation we found at this point is associated with the usage of the ReetrantLock READ lock. The read locks are normally not designed to have a notion of ownership. Since there is not a record of which thread holds a read lock, this appears to prevent the HotSpot JVM deadlock detector logic to detect deadlock involving read locks. Some improvements were implemented since then but we can see that the JVM still cannot detect this special deadlock scenario. Now if we replace the read lock (execution pattern #2) in our program by a write lock, the JVM will finally detect the deadlock condition but why? The lack of read lock per-thread tracking appears to prevent deadlock detection for this scenario and significantly increase the troubleshooting complexity. I suggest that you read Doug Lea’s comments on this whole issue since concerns were raised back in 2005 regarding the possibility to add per-thread read-hold tracking due to some potential lock overhead. 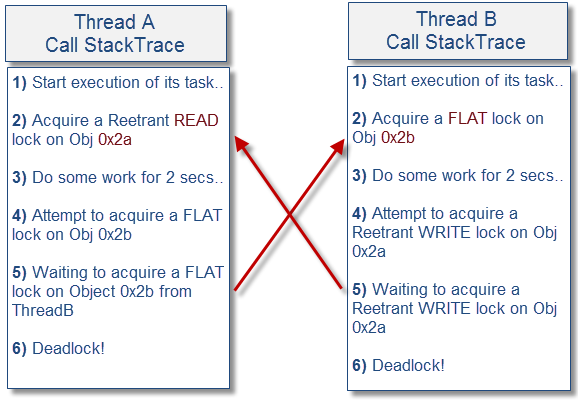 Analyze closely the thread call stack trace, it may reveal some code potentially acquiring read locks and preventing other threads to acquire write locks. I’m looking forward for your feedback, especially from individuals with experience on this type of deadlock involving read locks. Finally, find below a video explaining such findings via the execution and monitoring of our sample Java program.